Colca is situated high up in the Andes of Northern Peru. We had booked an excursion from wonderful Arequipa, staying the night in the Andean village of Chivay. The village stay was notable for two reasons. Firstly the meal of guinea pig & pisco sours accompanied by a Peruvian panpipes band. Secondly because the hotel room in which Hamish and I stayed was the coldest indoor temperature I had ever experienced. So much so that I slept fully clothed! Going back to the band, the leader had an incredible strop as he felt we were not appreciating their efforts enough. Indeed we were more interested in getting acquainted with each other in our small group, so much so that the band threatened to walk off! Quite frankly we probably wouldn’t have cared that much, but gave an enthusiastic response to the classic El Cóndor Pasa. 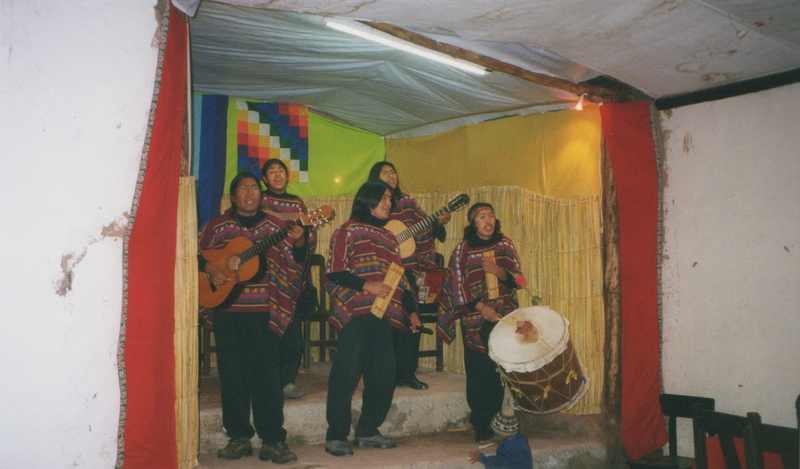 El Cóndor Pasa is an orchestral musical piece by the Peruvian composer Daniel Alomía Robles, written in 1913 and based on traditional Andean music. It was made famous in the West through Simon & Garfunkel putting lyrics to it in 1970 (I’d rather be a hammer than a nail etc…..). Back to the main purpose of our trip. As a rule I am unlucky with my wildlife spotting in the ‘wild’. It was a long way to go to see some birds, albeit some very impressive ones. With my track record, I was reluctant to commit. What if the broad-winged beasts were elsewhere at this time? I was given a cast iron guarantee that they would be present. Not a ‘or your money back’ type guarantee, but good enough to persuade me to part with my dollars. I was a little perturbed to find that we only had a two hour window of opportunity to see the birds of prey, but figured this would be plenty of time to take in their majestic form. Our minibus parked up alongside several others and we were directed along a path to the cliff edge, where on a rocky ledge sat three condors. Snap snap snap. Now, when do they take off and stretch their considerable wings? When the thermals are right so they can hang on the breeze apparently, hovering until such time as they have spotted their prey and swooped for dinner. Well the trio of inanimate birds, the largest flying birds in the Western Hemisphere, were worthy of a few pictures, but we had all come to see them floating gracefully, their three metre wingspan drawing gasps of admiration. There were only so many shots we could take of the canyon, beautiful as it was. We waited, and waited and waited. Other minibuses that had arrived before us left, their passengers disconsolate that the birds had remained as flightless as an ostrich or indeed an elephant! One hour-fifty passed by. I had done it again. A Jonah of the highest order! But then, without warning, something stirred. One of the New World vultures stood up, stretched its wings and launched itself of the ledge, soon to be soaring high above the canyon and the Colca River below. He was quickly joined by his brethren and for ten minutes a minibus full of travellers clicked away, in those pre-digital days praying that they had got a decent shot. How did I fare with my basic Canon? I will let you judge. very interesting theme. thanks for sharing! You have been to some truly amazing places. So jealous! A very special moment. I have similar luck to you – glad this time things worked out better!